A new angular contact ball bearing has been developed that prevents the premature failure of ball screws in short stroke applications, particularly those that occur due to false brinelling. 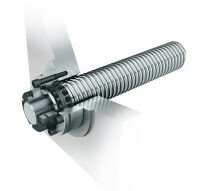 Short stroke operation of screw drives can result in the premature failure of bearing supports due to false brinelling. This occurs when the separating lubricant film between the rolling elements and raceways is no longer present, for example, due to a lack of relative motion between the rolling partners or where the pivot angle is very small. This leads to localised fretting corrosion where the unprotected steel-to-steel contact point starts to corrode. Vibrations cause the corroded parts (rust) to detach as they are formed and become embedded in the lubricating grease. Over time, the rolling elements fuse to the raceway, which eventually leads to bearing failure and machine shutdown. With bearings for screw drives, false brinelling repeatedly occurs if the corresponding axes are at a standstill for extended periods of time or if they perform small strokes. Depending on the pitch of the corresponding ball screw spindle, these strokes distances are typically between 0 and 2mm. Due to the small workpiece sizes involved, false brinelling is a particular problem in mould production and medical equipment. Schaeffler’s new ZKLF..-HC hybrid angular contact thrust ball bearings provide a suitable solution. The bearings use ceramic rolling elements, so there is no possibility of metal-to-metal contact. In addition, the limiting speed is increased and there is a threefold increase in grease operating life. Up to now, hybrid bearings have not been used for short stroke ball screw applications, as their basic load rating is around 30 per cent lower than that of corresponding standard bearings, due to the higher modulus of elasticity of ceramic balls. As a result, the contact zone in the raceway is smaller and the corresponding pressure under comparable loading is higher. However, field use of hybrid bearings has shown that the life ratings achieved are at least comparable with those of conventional standard bearings. As a result, the DIN standards working groups have decided to withdraw the theoretical reduction of the dynamic basic load ratings. In practice, this means that the positive findings gathered from field use of hybrid bearings have now also been incorporated into the basic load rating calculation. Even though there is still a reduction in the basic static load rating, this is not normally a limiting factor in the majority of screw drive support bearing applications. In terms of lifecycle costs, this means there is now nothing to oppose the use of hybrid bearings for ball screw applications. For more information on Schaeffler’s ZKLF..-HC hybrid angular contact thrust ball bearings, please call Schaeffler UK’s Marketing Department on 0121 313 5870. Alternatively, email info.uk@schaeffler.com.